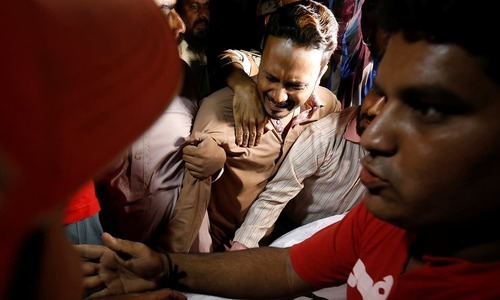 At least 70 people were killed and more than 150 injured in a suicide attack on the shrine of Lal Shahbaz Qalandar in Sehwan on Thursday evening. “So far 70 people have been killed and more than 150 have been wounded,” Inspector General Police Sindh A.D. Khawaja said. “Many of the wounded are in critical condition and they will be shifted to Karachi as soon as navy helicopters and the C-130 plane reach the nearest airport." Medical Superintendant Dr Moinuddin Siddiqui of Sehwan Taluka Hospital confirmed that 61 bodies were received by the hospital. Deputy Commissioner Munawar Maheesar confirmed the dead included at least four children and 12 women. Sehwan is located 193km to the north east of Karachi. 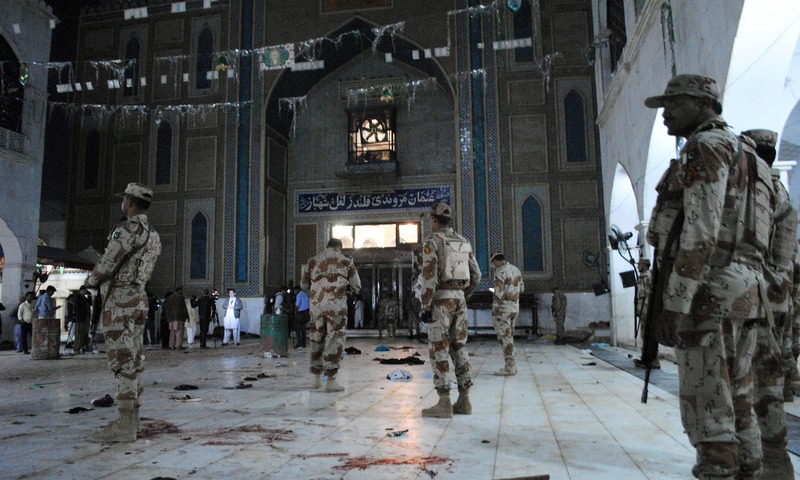 The Assistant Superintendent of Police in Sehwan said a suicide bomber entered the shrine through its Golden gate. The attacker blew himself up after throwing a grenade, which failed to explode, he added. The explosion took place in the area where the dhamaal (a Sufi ritual) was being performed after evening prayers. 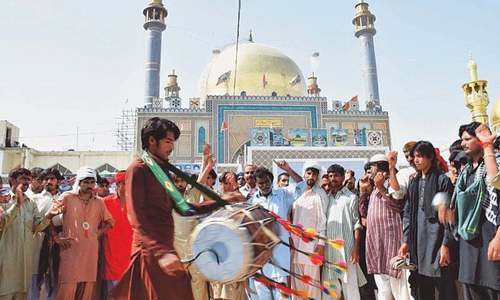 A large number of devotees, from different faiths and from across the country, frequent the shrine on Thursdays — a day of spiritual significance in Pakistan's shrine culture. 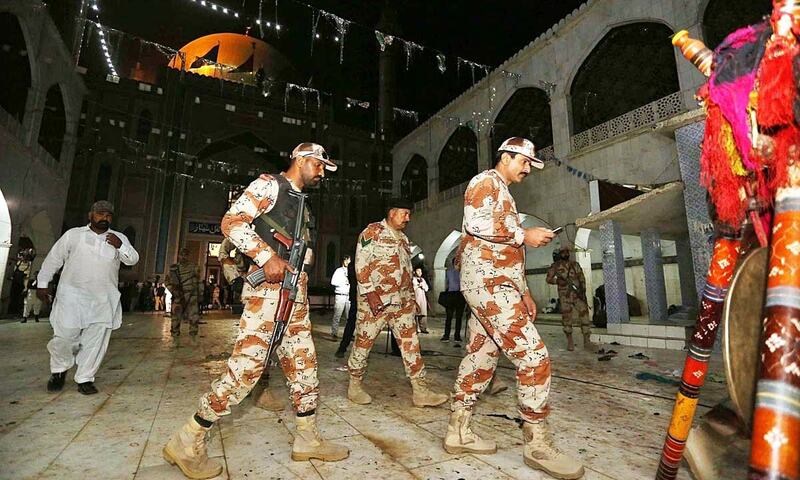 Security for shrines was tightened across the province following the attack. 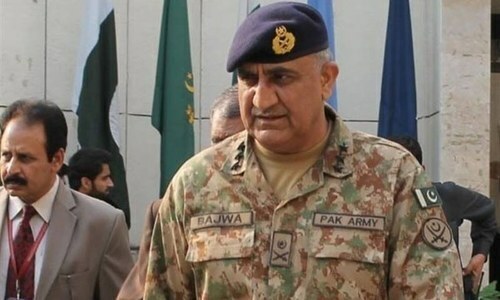 Chief of Army Staff General Qamar Javed Bajwa, following the attack, directed that immediate assistance be provided to civil authorities. Army contingents were dispatched along with medical personnel. Combined Military Hospital Hyderabad was also alerted to receive casualties. Air evacuation of the injured was started from Nawabshah airport, the armed forces had tasked a C-130 aircraft and helicopters to aid in the effort. The injured were taken to Karachi and Hyderabad, the Inter-Services Public Relations (ISPR) said. The ISPR added that the armed forces had placed all required resources to facilitate the rescue effort. Pakistan Army and Rangers assisted with rescue efforts at the site. The chief of naval staff placed all navy hospitals in Karachi on high alert. The air force also placed its hospitals on alert to treat the injured. Chief Minister Sindh Syed Murad Ali Shah had directed all rescue teams to reach the spot of the attack. 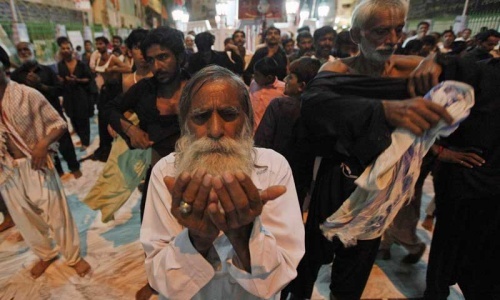 “Doctors from Jamshoro, Nawabshah and Hyderabad were sent to Sehwan,” Shah told DawnNews. He also said security has been tightened at all shrines across the province. Sehwan is Shah's constituency. 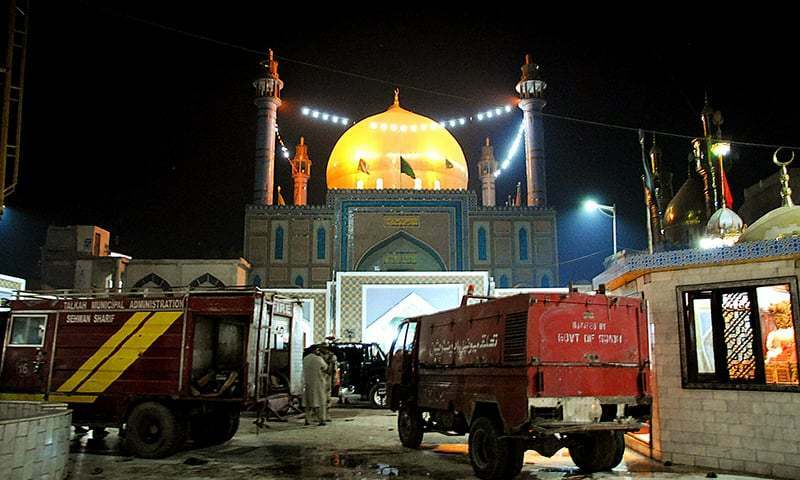 A mobile forensic van of the Sindh Police was dispatched to the shrine following the attack. Pakistan Tehreek-i-Insaf Chairman Imran Khan condemned the suicide blast and said he was shocked and saddened on the terrorist attack which targeted innocent people, including women and children. Interior Minister Chaudhry Nisar Ali Khan also strongly condemned the blast at Sehwan. He expressed deep sorrow over the loss of precious lives and sympathised with the bereaved families. 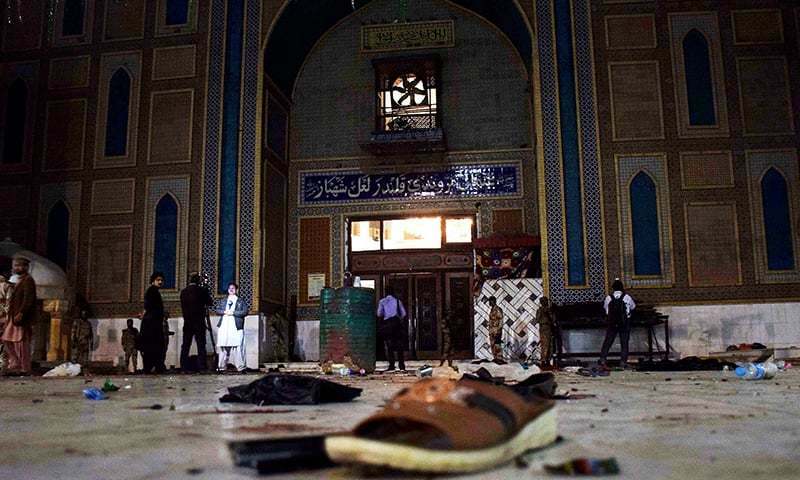 Chairman PPP Bilawal Bhutto-Zardari said the terrorist attack on the shrine in Sehwan was the worst form of terrorism aimed at ripping apart the Sufi fabric of unity and peace. "This was an attack on our culture, history and civilisation. Every single individual of this land will fight against the terrorists and uproot this menace, said the PPP scion adding that the perpetrators will be brought to justice. 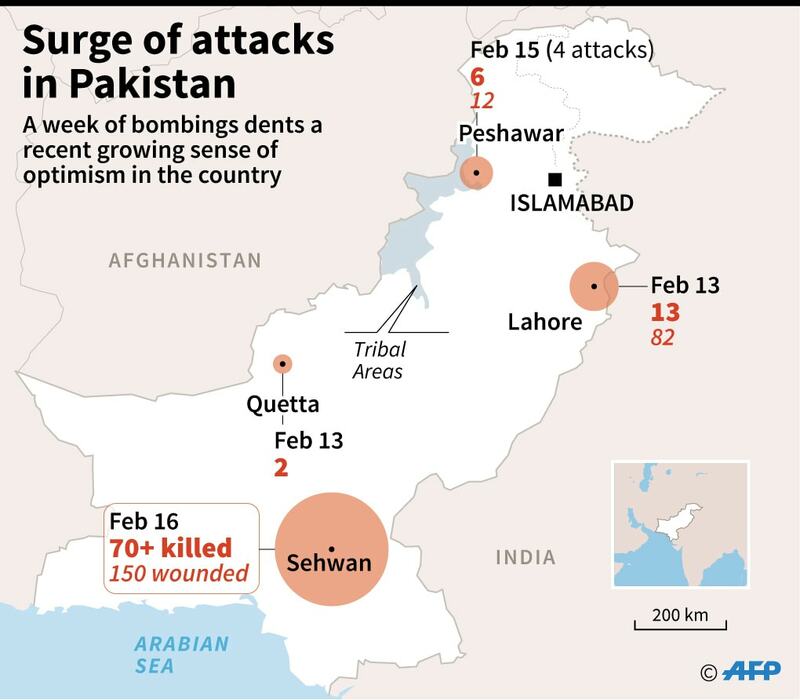 Pakistan seems to be experiencing a fresh resurgence in terror attacks. Earlier today, an explosive device had targeted an Army convoy in the Awaran area of Balochistan, killing three soldiers. The same day, a suicide bomber rammed his motorcycle into a vehicle carrying judges in Peshawar's Hayatabad Phase 5 area, killing the driver and injuring its four other occupants. The attack was claimed by the TTP too. The attack was claimed by the Jamaat-ul-Ahrar. 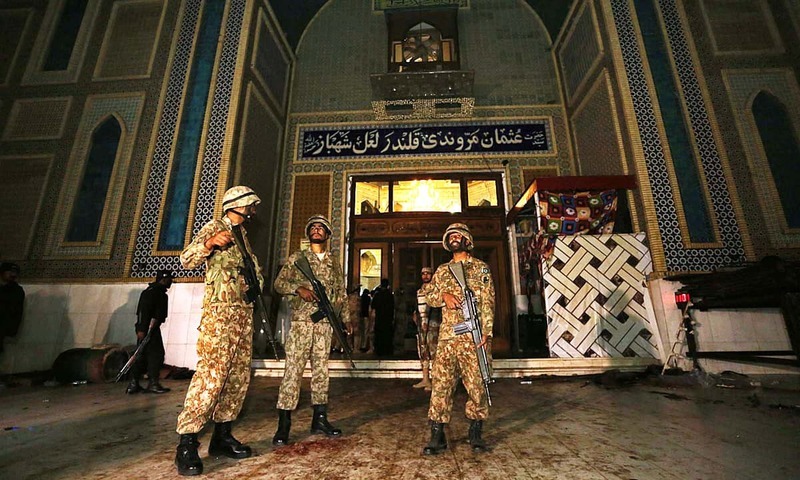 The last attack on a shrine of a Sufi mystic took place on November 12, 2016, when a suicide bomber struck the shrine of Shah Norani in the Khuzdar district of Balochistan, where at least 52 people were killed and 102 were injured. The explosion had also taken place at a spot inside the Shah Noorani shrine where the dhamaal was being performed. At the time of the blast, there were at least 500 people gathered at the spot to observe the ritual. Its sad. This has become a everyday news in pk. No wonder its image is tarnished in world. What is this rubbish?? We need to put down these extremists once and for all! What is going on? Is this an alarm? incompetent ruling parties and innocent peoples are suffering !!! Whether the Government has become insensitive or clueless to eradicate terrorism ? People should unitedly raise their voice. Very sad, terrorists must be defeated. Untill or unless. Pakistan will not take their war beyond border inside steps are useless. It will require resources and courages. And yet, not a sign of any public officials, who are responsible for security and safety of the citizens of this nation. I dread to think if this is going to be a daily occurance, when will the people of this country realize it is time to take charge of their own destiny and stop relying on this inept government which is big on promises, but delivers very little!?? Miss you General Raheel Sharif sahib. Round up all terrorists, both good and bad, and put them behind bars. If it is TTP then Pakistan should carry out an operation against TTP in Afghanistan. General Qamar Bajwa we demand concrete action against TTP dogs and their handlers. Lets wait for another condemnation from our so called leaders, then mourn for a while and then eventually the whole cycle will repeat. Disgusted at the inept leadership that we have, totally useless when it comes to protecting the common man from bloodshed. Many will say its got nothing to do with the COAS - ask yourselves was there so many explosions within a short time frame when General Raheel was around - the only ones we look to is the army and not these corrupt politicians, who are not promoting education which will also play a part in this extremist mindset. Stop blaming other countries and implement NAP. Terrorism is the pure evil.Did not I tell Before? All forms of it must be derailed ie both good and bad one for healthier and secure Pakistan. @Khan Gont. is just an extension of the people. When corruption and stupidity coupled with religious bigotry rules supreme, these things are bound to happen. The enemies are trying to bring down our morale. But this will only bolster the nation's resolve and our forces will crush them. It's conspiracy to tarnish the image of Pakistan and to stop the on going development in the country. We all need to strengthen the hands of our government to eliminate these terrorists groups from our country. Oh God. Pls give us courage and strength to eliminate this scrouge. General Qamar Bajwa nation demands solid action!! Enough with NAP. Time for real action. Destroy these terrorists hiding in Afghanistan. Why PML N resisted the rangers operation in Punjab? Urban cells activating to restore relevance.I think they are intensifying their effort because they are almost about to collapse. Where are our security agencies? Still PML-N is not ready to allow army action in Punjab to weed out the terrorists hiding there. Exactly why most of Pakistani political elite resides abroad, because Pakistan is unsafe for ordinary people. Yet, these foolish people invite these politicians back every few years, and hand them the key to the treasury and a seat of power to lord over them, till kingdom come. Only to start whining and complaining when their elected so-called 'leaders' fail to meet their expectations or promises made. What was the word for this phenomena? Ah, yes INSANITY!!!! Some one predicted yesterday in another Dawn news in the comments section that after Punjab, KPK and Balochistan .. Sindh could be next.. looks like the pattern is right.. all looks systematic and planned to create chaos across the country. Tall claims by the PML-N government proved mere rhetoric. Action required to provide security against the terrorists. How long it would continue? The army should take very strict and summary action. I would rather say that the groups involved in terrorism should be crushed. Ruthless action is required to be taken. Who will give shut up call to all those government officials and ministers who instead of taking action are doing "Muzammat"
Very sad news. It is hard to understand as to why any one would kill innocent people. All religious leaders should speak out clearly and loudly against such a killing. Let us hope no religious or political leader supports such a killing of innocent people. Furthermore, it is possible that enemies of Pakistan are determined to destroy peace of the Pakistani society as well as the economic growth of Pakistan. May Almighty help Pakistan. May almighty bestow his 'maghfirat' to those who pass away, healthy recovery to injured and strength for Sabr to near and dear ones of those who suffered. (Ameen). Judiciary must exert its presence to ensure a just society through accountability without ifs and buts. No body , repeat nobody, would be safe in this country very soon if these terrorists are not weeded out completely. These terrorists don't target only those who unabashedly tolerate their existence - even facilitate them in their heinous crime. "We will make Pakistan safe again for everyone"? Just like Trump is about to make America 'afraid' again! It is high time we get rid of our flawed policies of the past and get rid of all terrorists from our land be it good or bad ones. Incompetent and corrupt ruling parties are simply destroying Pakistan. Well people try to get over with this conspiracy of good terrorists. i don't think our political administration as well as national security agencies have such words in the lexicon. Moreover, it is my shear belief that they are trying everything to curtail this menace. HAVE SOME MERCY, PLEASE STOP KILLING. IT IS SHAME. A harbinger for us . The imminent devilish problems we will be facing due to our political disunity , non-prudent decisions , focusing just on country's embellishment , inactivity against banned organizations ; discrimination as good and bad and other in-competencies . What Image PAKISTAN has positioned in out world by conducting MILITARY offenses against militancy and extremism will all be ruined . Our salvation is solely dependent on a terror-free PAKISTAN . Pakistan seems to be in trouble now. What the security forces are doing despite of such a huge money spent on them. Very soon statements will be issued from all important offices that these terrorists cannot weaken our resolve to eradicate their menace. And after that business as usual till the next blast. Simple solution , seal the Durand line with an iron dome type technology . Enough of this! People must rise up or this vicious cycle of condemning and burying your loved ones will continue till the end of time. Stop being so feeble, shy and spineless and demand that the government guarantees safety of each and every citizen of this country or get out! Anywhere else, these leaders will be in jail by now,instead of being aloof to your plight and living in the lap of luxury while you mourn and suffer. But for how long? Are we going to forever be issuing condolences till we ourselves become the victim? Are we condemned to live in perpetual fear? This series of blasts has shown the vulnerable security situation in the country and that the recent lull in attacks was there only because the terrorists were in a process to settle down and adjust to the post army situation. This is what happens when you promote extremism and sectarianism. Act against all extremists whether good or bad. Remember your words,Mr. Nisar? May god give strength to families of the deceased. @Genghis Khan . Insensitive government or insensitive society? A sad day...how to stop this and bring peace. I am from across the border, only cowards can do this. Root cause need to be addressed on urgent basis and that is teaching tolerance at every level and accepting an individual's beliefs as it is and not to be judged based on a particualr sects beliefs only. Atleast the next generation should grow without prejudices and hatred. All these terrorists think themselves religious police. They don't have any right to kill innocents people. Arrest them and kill them. I am so saddened by this news. I am an Indian and I always desired to visit this shrine of Shahbaz Qalandar. @Shahzad . NAP? No, no, it is not a nap, it is a long deep slumber!! OUR Army & most of all Government has totally failed in combating terrorism. Total Failure. Lost for words. RIP the common man. This is becoming so frequent that people are becoming numb to all this sickening news of random killing and destruction in most Muslim nations. Something fundamentally has to change to stem this. It has to begin with leadership. Among all the major Muslim nations, where this sort of carnage is never witnessed, is Iran - the only truly Islamic Republic. Something to think about! PAKISTAN ARMY.......Please help us and save Pakistan. DO some "Lethal operation" across the board in Pakistan. NO TIME TO WAIT.... Our governments and specially SINDH government is totally incompetent. Naveed Mukhtar and Rizwan Akhtar help out something. Is there a co_relation between putting Hafiz saeed under arrest and these blasts. @khan you have hit the nail on the head. This is the writing on the wall. This cannot continue forever. Oh, why this series of blasts killing our own brethren? Extremely sorry to learn about this tragedy. things are not going to change drastically by killing one and two terrorist here and there, unless severe action is taken against the financiers, sympathizers and supporters of this mind set. For that to happen the state and its institution must revisit their policies. @Taimoor Ahmad ... Pakistanis are waiting for you to lead them into action. Sad that innocent people are killed due to failure of governments. R.I.P those you lost their lives.7 attacks in 5 days. @Omar .... ... You have to find them first. This is really pathetic how on earth some one can be so cruel ! !RIP and god gives strength to deceased family. Pak govt must do some thing..this is becoming daily routine very sad !! Current situation of the country is not handled properly. Politicians are doing politics and I am also not satisfied with the Army operations. There is no operation against religious parties who are spreading extremism and sectarian violence. Too much to be done and nothing has been done to eliminate this terror from Pakistan. What ever has been done so far is just not enough. A big question marks on the zarb-e-azb operation, which was launched by the Pakistan Military for the elimination of terrorists, who had found safe sanctuaries there. Though, the terrorists have been killed and maimed in large number, but it seems that they have not been fully neutralized and their network of bombers, plotters, and sympathizers is still intact and they have the capacity to strike on their chosen time and spot. The Security Agencies must keep their morale high and spread their network to catch and neutralize their local sympathizers, while strongly believing that last victory is of Pakistani State, despite full blown interference of India and Afghanistan in our internal security matters. What about those who are still alive. Can't they live in peace? Only rest in peace after they are dead? What about the survivors of those who are the victims of recurring terrorism? How can they rest in peace? All provinces targetted in just 4 days, what is going on? How can there be anything for the masses when everything is gobbled by the corrupt? Certainly, these are not the signs of a peaceful & prosperous country where innocents are murdered repeatedly. Very sad incidence.I pray God to save both countries from such Powers who have no value for human lives.Now,it's time to work jointly n fight against these powers instead of increasing disputes.Dawn is also doing good job in joining people of both countries. Where are our intelligence agencies? Public places being targeted on daily basis. All public places should be guarded and security should be tightened. The nation is in the state of emergency. Prayers for the dead. We never should have let Raheel Shareef Go ! his extension was crucially needed for Pakistan's betterment. Certainly it is a barberic inhuman terrorist's attack against the people of Pakistan.Those attending shrine are common people attending the shrine to get some peaceful moment ,to pray . Damn to attackers condolences to the victims. My condolences to the victims of this heinous crime. Immediate solution is brutal suppression of these devils while long term solution is to reform education,regulate the content of madarsah and symphatiser of extreme ideology. General Bajwa, time to get active prompto. This will never end as long as "Good terrorist, Bad terrorist" perception exists. The common man is paying dearly for decades of flawed policies. RIP. Failure after failure of intelligence and Law Enforcement Agencies, the heedless incompetent and corruppt rulers and their subordinate are responsible for all the slaughter of innocent public. @Genghis Khan no, not behind bars. Eliminate them. The ordinary people of Pakistan have suffered a lot. When will the government wake up! As an Indian it saddens me a lot. All this is so horrible..So many families ripped apart.. He will never resign. Why should he resign? Such action is taken by only by those who have some sympathy for the masses and feel shame at their abject failure. They feel that they have been ELECTED to lord over 200 million hapless people. The likes of our present rulers are safe and secure in their fortified castles. Very sad I thought that you were winning the war on terrorism. Sufism is the most advanced and reformed form of Islam. Which is neither radical or extremistic. This is an attack on the moderate and rationale ideology of Islam by the Extremist & Radical ideology of the same religion. I hope Sufism will not suppress by these coward and anti humane activities. @P K THAKUR ...Thank you for your sincere condolences i'm sure. This Pakistan is safe for only those who live in fortified castles and move out surrounded by hundreds of security personnel. So if any harm comes, it should be taken by the police and ordinary people. This is very sad news and we sincerely hope these terrible attacks stop or slow down significantly in Pakistan. Our sympathies are with all the innocent civilians and their families as well as any Pakistan armed forces who have been affected by this cowardly attack. NAP NAP NAP...interior Sindh, Punjab!!! Unless you catch those facilitators this will continue :-( Political parties have links with banned outfits because they provide them the vote bank! Stop differentiating between good and bad terrorists. Terror is always bad...Shut the mouths of those who say good terrorists. How can terror be good? I am feeling benumbed, dazed and speechless. Bring back Raheel Sharif, please please please. @gaffer ...There is no such thing as good terrorists buddy,all terrorists are bad. Sad, very sad. We need to eliminate this from our soil. If we can fight for independence under one umbrella, why can't we fight this mess. This war against terrorism will be won only if action against the terrorists is taken on every inch of our Pakistan. It cannot be won if the most populous province remains a safe haven for the terrorists. Period. RIP Does anyone know how to stop this madness. @adil Is this the job of chief or CM and Police? If you think chief then let there be no CM or police. Sad. The bulwark against terrorism created by General Raheel Sharif has collapsed with his departure. Changing military command in middle of war against terror has proven to be a lethally wrong decision. victims of politics - Interior Sindh and Punjab need sweeping operations ASAP and bring back NAP. There is no room for error anymore - stop thinking you're doing this to appease someone (India, Afghanistan, the US et al.). Do this so that people don't have to bury their loved ones in pieces. FOR THE LOVE OF GOD, PLEASE STOP THIS MADNESS! So sad... Enemies of Pakistan from inside and outside at work. RIP common people. We r sufferer of fail government. I hope atleast some heads will roll this time.Instead of blaming "foreign" hand and getting away from accountability as usual. This is the result of tolerating extremist ideologies being promoted by some friendly countries in the Middle East thru paid Mullahs.Pakistan will disintegrate if such thoughts are not defeated.Pakistanio Jago,we have an absolute untrustworthy leadership. These blasts and lost of lives have become a routine and our security forces are just counting incident over incident. They forget the previous blasts and continue to wait for new blasts. Is there anyone who could investigate their performance??? What is going on in Pakistan. Where these agencies and what measures are taken to prevent such incidents?? @Make Pakistan great ...RIP all the departed. V sad to know...... land of sufi is bleeding now........... RIP to the departed souls and request to govt please please for God sake...... wake up...... every blast is mourned for few days and again things goes normal for quite some times then again...... with break of some time terrorists set an other target to tarnish innocent souls. Very very sad.... Humanity is diminishing.... may god give strength to our Pakistani brothers and family members. The World should finally acknowledge that truly Pakistan is the biggest victim of terrorism in the World. It is very SAD. What terrorist going to achieve. Human life lost without their faults. My heart cries. I pray for the lost soul RIP. Terrorist please stop this. Everybody has got natural right to live. @ali things happened during raheel time too. The root cause is in the mindset. @Amjad Khan id agree with that. @SANJAYA KUMAR it usually means you are not fighting the right way. how many times such type of attack will happened? Separate religion from the affairs of the state and just go HARD on any religious sect which pushes it's own agenda! Make sure there are no religious sympathisers in the security services' and just watch terrorism fizzle away! Very sad news. RIP for those who died and prayers to get well soon for the injured. We understand your pain. It's time to defeat all types of terrorism and time to join hands for doing it. One day of mourning in Sindh will soon be declared by Mr. Murad Ali Shah and he would feel that he has done his DUTY. Well done, CM and all his government set up. RIP such a sad news , condolences to all the affected families. How come these beasts dont even spare a auspicious and respected place like Sufi shrines, god help us. very sad incident. we demand our national security this is challenge to our sovereinty really we miss G. Raheel Shareef. Until and unless the religious extremist political parties and the religious groups involved in terror activities are contained and strict monitoring of these parties and groups is not done, incident like this one will keep on happening. Shahbaz Kalandar was a great sufi who spread only love for God and his creation and that is the reason he is loved not only by Muslims but also Hindus and Christians. Sehwan Sindh is a settled area.All responsibility lies on Sindh Govt. Governor Rule is needed. @Kunal they haven't done anything yet then they never will. Sympathies from India. May god punish these idiots who planned this. My Pakistani bothers, please wake up and stand up against the terrorism. It hurts the same when we lose poor souls in India. Sad news, yet again innocents lost their precious life. Please eliminate all terrorists both good and bad. @Hassan Parvez Very rightly said my brother. Sufism is peace loving. govt fails one more time to maintain law and order situation. Condemning such violence, condolences from neighbor. This is the sixth blazon attack in Pakistan in less than three days. It’s heartbreaking to hear that devotees of the famous Saint are killed in senseless attacks. We have seen innocent people being targeted and killed during the last few days. It makes one wonder; do the terrorists even care about the sanctity of the holy shrines? Placers like Sehwan Sharif are religious and cultural heritage of any nation, but the terrorists have been destroying these places wherever they can. These holy places are frequented by families including children. In today’s attack as well many killed are women and children. Our hearts and our prayers go out to the loved ones of all killed in this ruthless bombing. We again reiterate that mutual cooperation will allow us to get rid of the menace of terrorism in the region. We need to remain unified against those who continue to work against our peace objectives in the region. Oh God, Pls save people. What s this. Pls stop this. Can't able to stop my tears. I feel extremely sad that repeatedly common innocent people are getting killed due to terrorism. terrorism knows no caste creed Religion since ist main purpose is to butcher defenseless human beings. My condolences to the People who laost their near and dear ones. Hopefully the Pakistani Government really takes strong measures to eradicate terrorism and it's supporters from Pakistani soil. Pakistan need a major army oration against terrorist. Loss of so many innocent lives at a place of worship.. we are filled with grief. My heartfelt condolences to the families and Pakistani citizens. We feel the pain. 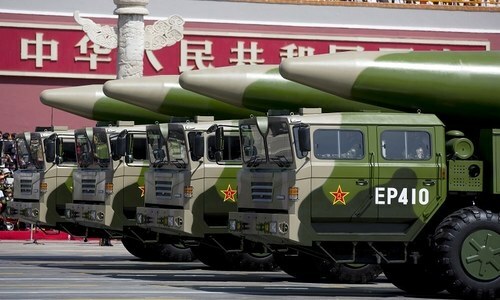 Hope the governments in the region work together and wage a war against the violent elements. These criminals endanger the lives of our children. Prays from India for our Pakistani brothers. My condolence to the family of deceased and prayers for the recovery of injured. Heartfelt condolences. This shrine is shared heritage of both India and Pakistan, needs to be preserved/ restored at all costs. Sad, really sad! Where are we heading as a race? This has become routine all around the world. No place is safe anymore including places of worship. Who would do this kind of violence and still be able to sleep at night? No words! My condolences! heartfelt condolences from india and prayers for the families. . something is seriously wrong when a sufi shrine is targeted. It is so shocking...........beyond words! Sufi Saints always preached humanism. Shahbaz Qalandar was a great saint. Every one in this Sub Continent has heard the song Dama Dam mast Qalandar and even sung it. My heart felt condolences to all those who lost near dear ones. It will be a befitting tribute to all those who have been Martyred that a Sufi Shrine built in their memory in their hometowns. Govt. should provide land for it and Followers of Sufi Saint Qalandar must come forward to spread his message of Love to all. May God give bereaved families the strength to bear the loss of their loved ones!! Sufisim is an integral part of our culture and it must be preserved at any cost from radical elements. RIP!! Very sad for inocent lives lost. I condole the death of innocent people. Sad Sad Sad.... RIP people who have lost their life, and my condolences to their family! Their family will be in our prayers! Sufism is the essence of love. sad news.prayers for speedy recovery of injured. ay the souls of those killed rest in peace. Sad news !! Condolences from Indian friend. God give courage and strength to people in Pakistan ! I pray for stability in the region. Very sad how can they attack a religious sacred place and kill inocent people. Pakistan needs to act now and get rid of all these outfits supporting terrorism. @Shahzad this has happened in Sehvan which is part of sindh. I deeply condolence the death of innocent people......n Wishing a speedy recovery of injured people. Giri from India. There seems to be a pattern here. APS happened, people were enraged, army took action in tribal areas. Bombings happened in Karachi. People got angry. Army/rangers took action. Now Karachi/Lahore etc are seeing the same thing. Does Pakistani establishment require these kind of bombings to gain people's confidence before acting on banned organization? Something is very messed up. Condolences for the poor people are fodder for these sort of power grabbing political games. I am deeply feel sadened by this act of brutality and pray to god for the lost soul. This time being an indian i am with my pakistani brothers who lost their dear ones in this incident. My deepest condolences to the family of the victims. I hope the injured get a speedy recovery. Innocent ppl are dying everyday..
Feel sorry for the innocent families who lost their dearests. Deep condolences....... what a shame.....but end of the day, you reap what you sow and common people suffer. Sad news. Condemnable and a despicable act. This is sick, in-human, brutal and unaffordable at any cost... but it also proves a complete failure of security forces.. no wonder Pakistan get some more restrictions as its already stated a no family country in UN. RIP. why do they target the innocent people in a place of worship? So sad. May piece be with you all. Terrorism hits Pakistan once again: A despicable act of savagery. What a coward and barbaric attack on a sofi shrine that represents love and peace for humanity. Terrorism, no matter what form it takes, must be fought by all means and at all levels. Is government's failure to control increasing acts of terrorism partly due to the government's non- seriousness about fully implement the National Action Plan(NAP)? Terrorism can not be fully eradicated but it can certainly be controlled through effective security planning based on intelligence and law enforcement. These bombings should be a call for all Pakistanis to unite and reject all sources of hate in their society. Its time to crush the terrorists, no matter where they are and who they are, and I could careless who supports them, take them all out. This is where the Army should and will draw the line, I see it coming loud and proud. Dear Pakistani Friends, our hearts cry with you in this hour of grief. May god bless the departed souls and provide strength to their families. Another failure of intelligence service What are our institutions doing. This is a time the nation should unify and avoid useless comments here. aljazeera has it so must be true..prayers to the family and condolences..sad. I think UNo should send peace keeping mission. In pakistan like send in other terror affected area to maintain peace. This is sad that these blasts are raising their heads again. Very sad indeed. Condolences from India for dearly departed. The scourge of terrorism must be eradicated from the world. I have been to the area surrounding the shrine. It is deeply rural there are simply no facilities despite tens of billions allegedly spent on developing the site. Instead of hospitals they purchased landcruisers. Events such as this only expose the deep dark sides of the society. @JAMIL SOOMRO, NEW YORK CITY well but the problem will still be here and needs to be resolved. To all Pakistani people please accept my sincere condolences. I am so very sorry that death stalks innocent Pakistanis all over the country. Pakistanis have a right to live without fear. Please remember it is darkest before dawn. Hopefully all this will pass soon. Roy Meddock Los Angeles, California. we need actions, we need strong leadership against these terrorist. My heart bleeds that such things are happening there. As soon as Raheel Sharif left the govt dropped the fight against terrorism...now we know the cost of loosing one honest man. What a sad incidence, civilians should not be harmed in such a brutal way. On an another note, I was sad to see no mention of this incidence to CNN, FoxNew... Are these incidents so common or human life has no value left in our part of the world? Questions must be raised about competence of prime minister and Qamar Zaman as coas. Who is going to take responsibility and enunciate an effective policy? Where is National Action Plan? Condolences to the families. Wishing the wounded a speedy recovery. @Mahmood you nailed it brother. @Kulbhusan jadav Thank you. Your condolences means a lot. not the time to blame the govt, time to support the needy. condolences. Terrorism needs to fought in all form. No terrorism is good or bad. Pakistan india and Afghanistan should work together. Extremely unfortunate...and that too in a religious place. Rest In Peace all those who lost your lives. @Giri @Idrish Deep condolences to the families who lost their loved ones. Want to eradicate extremism? Start from Madrassas where such mindset is brewed and refined.No politician seems to be talking of that.Otherwise if you kill five ten more will rise up. I am challenging each and everyone here- who is honest & brave enough to do some serious introspection, and to identify and ERADICATE this religious based hatred and terrorism from Pakistan. ..
Heartbreaking truly. My sincere condolences!!!! @Syed Waqar Ali. I agree, but this is not something army can solve. Civilian government should step up and take all necessary actions to eradicate this evil religious terrorism. RIP for departed souls and speedy recovery for injured.. Terrorism should be condemned and deal with sternly without any discrimination. Extremism of any kind is cancerous. May the poor souls RIP. Sufism is an integral part of the syncretic culture in the subcontinent. The Sufi shrines are revered by people of all religions. Why are they repeatedly coming under attacks in Pakistan? Taliban have declared war on Pakistan. Now I think is time for Pakistan and Pakistanis to declare war on Taliban. No more prisoners... shoot to kill! Very unfortunate,heartfelt condolences to the victims of this cowardly act.now the time has come to stop distinguishing between GOOD and BAD terrorists .terrorist are terrorist working against humanity and must be finished otherwise they will finish humanity. This is very sad. My heart goes to the families who lost their loved ones. This is an unprecedented failure of Pakistani domestic intelligence and police. These possible fanatic TTP suicide bombers should have been identified and neutralized before they can carry out such a devastating attack. This clearly shows, TTP is now regroup and there will be more attack on the innocents and helpless. Pakistan government must provide more resources to identify possible suspected suicide bombers. Government's fake talk is not acceptable under any circumstances. They are responsible to provide security to each and every citizen. It's time the Pakistani government and the Army put a lid on terrorist groups operating from Pakistan. No good terrorists and no bad terrorists. The people of Pakistan should pressurize them both and hold them accountable for such despicable acts. May the victims RIP. This is so sad. What is this government doing? No control? No safety for the citizens. This is the worst atrocity committed anywhere in recent times. The culprits need to be identified and nailed. RIP the victims. It is evident that there's international conspiracy to destabilise Pakistan. I feel sad today for the merciless loss of lives. Soo sad. Please stop this now. Enough of bombing and killing the civilized elements of Pakistan - be they shrines and pilgrims, civilians, artistes, women, minorities, law enforcement officials, advocates, human rights groups/ social workers. It's wrong to prey on the vulnerable and soft targets. We need to act now. Dismantle all the terrorists infrastructure, stop hate speeches, jail all the militants. Sad. Condolences to those bereaved and wishing a speedy recovery to those injured. Need to take action against all terrorist. Very sad ! My prayers are with the families of deceased ! No major blasts or terror activity happened in Pak during American Elections, ( Nov 2016 through Mid Feb 2017 ). As the new US administration settles in, the blasts and terror activity resumes ! Its saddening. RIP for all departed ones. When the menace of terrorism leaves Pakistan. Its high time we introspect ourselves and take decisive measures. Such incidents not only results in loss of precious life but also affects CPEC's future. Feeling sad for Pakistani people. We submit our heartfelt condolences from India. Please have strength to overcome this irreversible loss. Our prayers are with you. Hope we understand the lives and sufferings of a common citizen. Prayers!!! May God bless the souls of poor victims. They didn't have to die such horrible death. My prayer with their families. 70 lives gone for no reason. All support to Pak armed forces to take down these terrorists, very sad that they target innocents. Deepest condolences to those that have lost their loved ones in this inhuman brutality. When will the Govt of Pakistan wake up and act in the interest of its own citizens? My deepest sympathy with the families.. This is the time for Pakistan to take a decisive step to wipe out all terrorists without any discrimination..
Its sad to see such cowardly attack at the innocent people. May god keep the soul in peace. Pak should remove the root cause of these terror activities as it is killing our brother and sisters again and again. common people always on target, even in the house of God is not safe for them ,this incident shows the deep roots of extremists in Pakistan . This is very sad and painful for the entire nation. My sincere condolences to the families who have lost their loved ones.All human lives are precious whether its Pakistanis or afghans or Indians. Very sad to hear the news..
@Genghis Khan Well said Cheghis khan. @Ali Vazir, True, That's what the gov. of pak need to do. there is no good or bad terrors. Thrown away all of them. If required we will help you. 2 minutes mourning slience for the departed souls. RIP. My deepest condolences to all the families effected. Any form of terrorism must be handled with iron fist and discouraged. It seems there is no value for human life. No entry in the Pakistan from any border without visa. And Army must not be active after attack at this crucial time when peace was returning to the homeland, they must be proactive. Where are their intelligence agencies who have every information? It is their lacking and relax behavior which caused this new terror wave. People remember what happened at APS Peshawar, intelligence agencies have the information but they did not able to stop it. Please bring permanent peace to my homeland. Very very sad. God save this world. @Feroze Danish He would have had to retire eventually. Hopefully the new one can step up to the plate and act fast now. These attacks have been happening for awhile now and the problem is far from solved yet apparently. For too long people have had to tolerate these terrorists and done absolutely nothing about them. Whatever action is being taken seems to be very slow and reluctant perhaps, as if terrorism is too much entrenched with the social fabric that it hasn't been able to be completely shunned and eliminated altogether by now. Pakistan should destroyed the headquarter of terrorists in Afghanistan within hours of first attack of the present wave of attacks. Even now destroy their command and control system immediately before our blood is frozen on the earth of Sehwan. Ban all communication through social media because it is the most lethal weapon of terrorists because you cant trace them like telephonic conversations. Very shameful and cowardly on part of those who are hell-bent on causing mayhem and do not see any merit or feel pangs of utter pain in killing innocents.Which mindset or ideological or religious leaning justify this?Sheer mindless and outrageous acts which deserve only abominable response from all those who believe in humanity and peaceful living.Time for unanimous action and singular approach against these elements.Defeat for this ideology and triumph for constructive and humane outlook.Condolences for the bereaved families. I CONDEMN THIS INHUMANE ACT. Extremely Saddened by this news, please spare the place of Love , Peace and most important for sub continent Place of "Tolerance"
Sad ..tragic.. humanity dying everyday in the hands of terrorist.May the soul rest in peace. So many innocent people are killed that too in a temple where they feel the safest. How many children are orphaned and how many widowed. if we hate this world we should kill ourselves and not blow up so many other innocent people who want to live. Heart goes out for the families who have lost their loved ones.... Terrorism has no religion, no caste, no creed. Lets pray and hope for our children s of future that they may never witness such hostile situations. Terrorists are abominable inhuman creatures. They do not care for the sufferings and loss of life of the berieved families. Sad news. May God give courage and solace to the grieved family. I wonder what do these terrorists get by killing innocent people at all. I hope to God these politicians wake up and take firm action against terrorists. A terror act needs firm and severe punishment - whether inside or outside of the country. Our prayers are with the families of the innocent victims of this terrorist attack. Heartfelt condolences from India. Innocent lives matter wherever they are on the Earth!! @Farooq Akbar. What are you saying? What this got to do with US elections? Talking about some stupid conspiracy theory again? Condolence to the relatives of the dead, quick recovery wishes for the injured and respect for the people who defied this barbaric attack and had their 'dhamaal'. Politicians should not be blamed, since people are ruled by those who are like themselves. Pakistan is reaping what it sowed .Condolences to bereaved families.